Pink Muhly Grass, shown below, is a terrific low maintenance ornamental grass. Landscapes often have sizeable full sun areas that need a practical, drought tolerant plant to fill out the space. Pink Muhly Grass provides an excellent choice for such a situation. A full sun ornamental grass, this plant gets between 2 and 3 feet tall by 2 feet wide. It has an open, airy look with narrow clumps of green foliage during the spring and summer months, and then transforms in late summer into a picturesque array of fall pink plume like flowers. 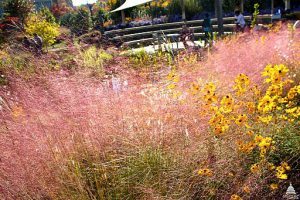 Pink Muhly Grass adds a delicate texture to gardens, an excellent contrast to surrounding brighter colors. It will bloom until frost and then turn to a tan color in the winter before coming back the next spring. After it has died back it will attract birds, who will feed upon the seeds. Pink Muhly Grass will work well in a mass planting in a sun soaked area, with plants spaced two feet apart. It also does very well as a container plant. This grass can be planted anytime, but for containers the best time to plant is fall. It will grow in any soil that is well drained and has been amended with organic material. While Muhly Grass will require frequent watering when the plant is new and establishing itself, it will need little thereafter. While not completely drought tolerant, the ongoing water requirements are very low. 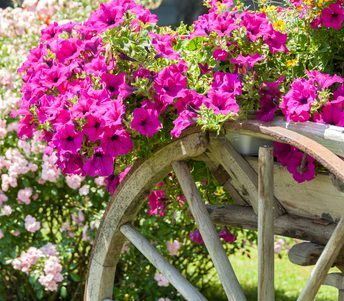 It will require very little maintenance, which allows time to spend on other areas within the garden. This is a plant that will grow well in zones 6-10.